When it comes to Christmas marketing, the end of Summer or even Fall is probably not something your small business is thinking about yet. Let’s face it, you have your hands full with the normal business functions you deal with on a daily basis, let alone the back to school hustle that can be a big distraction. So when should your small business start planning Christmas marketing? According to the National Retail Federation, winter holiday sales comprise more than 80% of the year’s total holiday sales for retailers. 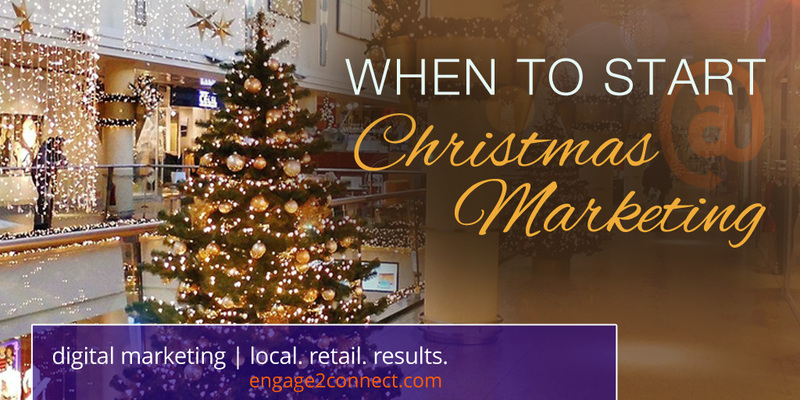 Being proactive with strategy and planning can help ensure that your local retail business is ready to take advantage of Christmas marketing. Sooner rather than later is key to holiday marketing success! So, you should start your Christmas marketing strategy, planning and execution probably much earlier than you might think. When Should Small Business Start Christmas Marketing? If your small local business is in retail and you haven’t already started planning for your Christmas marketing, you are likely behind the 8 ball at this point. That’s right, planning for the holiday season marketing should be way ahead of when you need it. In fact many small retailers begin their Christmas marketing planning before August and continue with strategy, list building and marketing execution throughout the winter holiday buying season. – 82% of consumers research products online before ever going into a store to make a purchase (Salesforce). Let’s cover some of the key elements to retail small business Christmas marketing that you need to know. Email: Building your email list throughout the year should be a priority in preparation for holiday retail marketing efforts for your business. As Fall comes, your small business should especially focus on improving your relationships with your email list by providing content that addresses their unique interests that provide experiences focused on them. Now is also the time to be planning your email campaigns, the content, promotions and messaging that your audience responds to. You want to be sure to capitalize on seasonal factors and focus on promotions around fall season preparations that make communications more relevant to your audience. It is also important that your plan will consistently send month-over-month emails which contributes to higher engagement with your customers. Finally be creative and compelling with your subject lines as they tend to be the biggest reason for lower open rates during the holiday marketing season. Social Media: One of the biggest mistakes small business makes with social media is waiting until they need it to focus on it. The problem with that is that it will not produce results that way. Your social media marketing should be active and effective all the time with a focus on growing your following consistently by providing value, unique and interesting content and slightly peppering your feed with promotional and educational content about your brand. Using Twitter and Facebook, small businesses should use the months leading up to the Christmas marketing season to grow their followings. This should be done with strategy and intent that targets the right audience that you need to reach. Having a larger following that is made up of your target customer is crucial to making your social media marketing effective and especially during the Christmas marketing rush. Content Creation: You’ve been inconsistent on your blog or maybe you never have got your blog even started. The internet and social media is made up of content and creating compelling content consistently has a direct impact on search, social media and website effectiveness. Your small business needs to be creating unique blog, graphic and video content on a consistent basis every week. Getting your content creation strategy and process in place and on schedule now is going to be key to working with the other digital marketing components listed above. Integrating your marketing with each of the other components strategically will make the difference in your eventual Christmas marketing campaign. Paid Media: Lastly, your small business should have a very detailed and comprehensive paid media program in place that takes advantage of the exposure that paid advertising provides. Developing targeted ads for search, social media and display ad networks is now a crucial component of digital marketing today. Even the smallest local retail business should be utilizing this tactic to break through the noise of big brand and other local competitors online. When should your start your small business Christmas marketing? There is no question that if you haven’t already begun to plan and execute for the holiday shopping season, you are at a distinct disadvantage. Planning is key here and the earlier you get started, the more successful your Christmas marketing will be for your local small business.